You will be given a reference e-book to read And the test will be based on that certification course. Physical therapy is a pivotal service provided in the medical field. These skilled, caring individuals work closely with injured people in order to help them regain some if not all of their mobility and wellness after a tragedy has happened. The field of physical therapy requires above all else a skill with empathy and with interacting with people. Individuals who have suffered a tragedy and are seriously injured because of it are going to be emotionally injured as well, and require support, patience and gentle motivation to achieve their goal of wellness. Patience is a virtue more so for a physical therapy aide that in just about any other profession on the planet, as recovery is a slow process, and patients, having been emotionally compromised and may not be the most pleasant individuals to work with at the time. They may be unmotivated, depressed or even angry, and a physical therapy aide serves as some psychological support as well as physical support in their recovery. This is an incredibly important service. In a year’s time in the United States alone, over 2 million people are critically wounded and left in need of physical therapy afterwards. Without a skilled physical therapy aide, these individuals would be left to either die or suffer, often due to mistakes or accidents that were not their fault. A physical therapy aide is an angel of mercy who can touch the lives of these people and will help them get back to living their lives to the absolute fullest. On the bottom line, this is a fulfilling career for someone who wishes to work closely with people and help enrich lives. This is one of those professions that makes a clear and pleasent difference in the world, a world that needs more people who care. On top of this, it's impossible to help the world until one helps themselves, and this is a lucrative, secure industry in which to pursue a career. However, due to sensitivity and importance of this field, it is not one in which someone can blindly enter. A physical therapy aide certification is absolutely necessary to enter this field, and the only way to obtain this is through a physical therapy aide certification course. The best physical therapy aide certification course can be acquired through online certification. Online certification will allow already busy professionals to study at their leisure, without a busy classroom schedule interfering with their personal or professional obligations or interests. But, one must choose their online certification provider wisely, because not all of them are created equally, and one of them is better than the rest. Which one of these multitudes of providers deserves the title of best? Brainmeasures understands that there are many people out there who want a lucrative, stable career where they can also make a positive difference in this world. This is why we have worked closely with seasoned, experienced physical therapy aides, and teamed them with our expert course designers. This powerful combination that our highly skilled course designers can draw on the experience and knowledge of these physical therapy professionals. This allows our students to gain a level intuitive knowledge and experience that no other course from any other online certification provider can come anywhere near. Not only can our competition’s courses not even come close to measuring up, but their prices can't match ours either. This all-important course consists of our high-quality physical therapy aide certification course, followed by our physical therapy exam. Upon passing this physical therapy exam, a certificate of a physical therapy aide certification is awarded to the student. 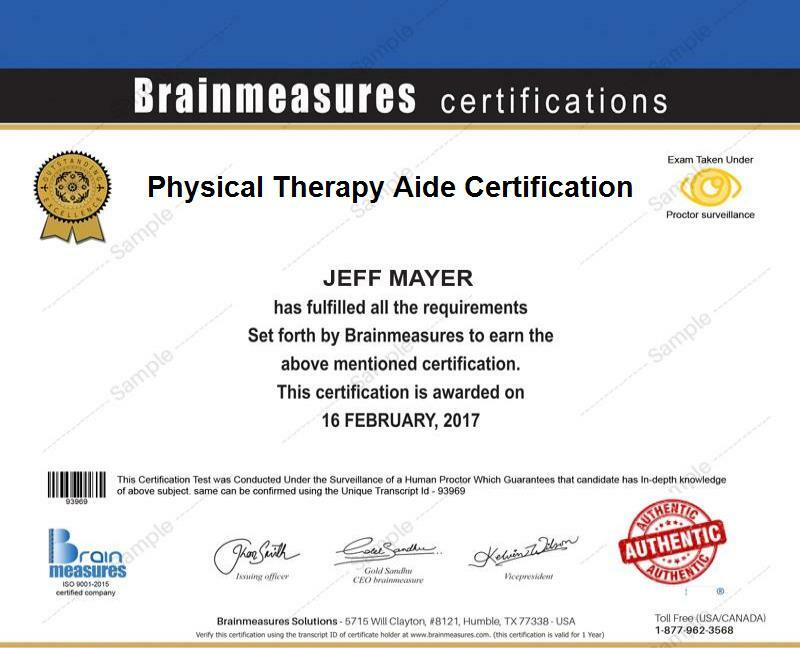 This is not just a certification, it is a Brainmeasures certification, and nobody measures like Brainmeasures. This is a course that anyone who is willing to put the time and effort into it can master. We designed this course to be accessible to anyone who is patient, and caring and wants to make a difference. There are many existing professions which could benefit from this certification if they do not already possess it. Physical therapy aides can earn between $120,000-$563,000 a year, sometimes more. This is a lucrative and very secure position. It’s worth noting that most physical therapy aide positions also have substantial benefit and bonus packages as well.